Happy Memorial Day! Today called for cooking and swimming for Mr. TBS and me. A lovely day at home, if you ask me! The end of a vacation is bittersweet, because obviously, the vacation is over, but nothing feels quite as good as sleeping in your own bed. I hope you're ready for photos, because I have a lot of them to share! I don't want to overload you, so I'll share half of my vacation today and the other half tomorrow. 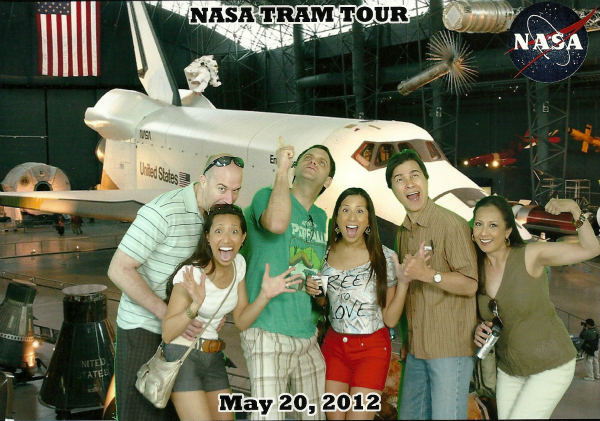 #1: The fabulous people I vacationed with -- my parents, Mr. TBS, my sister, and my BIL. #3: My sister and I battling it out in the gift shop with light sabers. #4: Oh, you know. 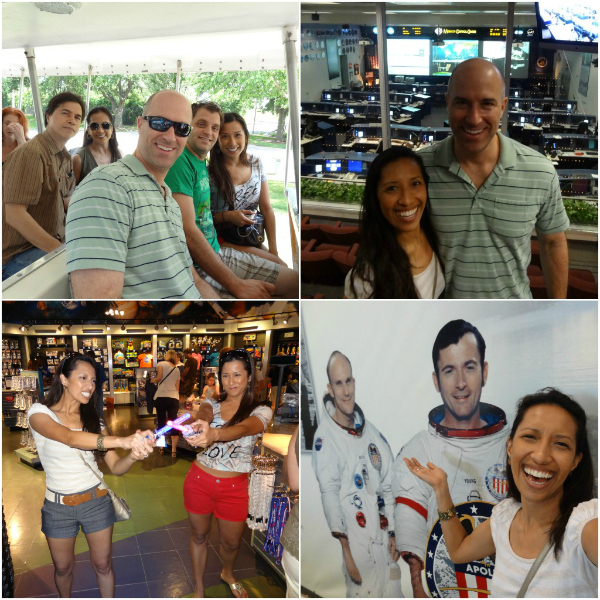 Just sharing some laughs with my astronaut friends. #6: A glimpse into the TBS home! #7: Of course, I had to share the glory of Hobby Lobby. As my sister took off with a cart, my BIL said with a smile, "This is my worst nightmare!" #8: Baby goat Daisy, who I mentioned before, is the only goat at the farm who is bottle-fed, because her mom is not there. She was treating my thumb like her bottle! #9: At the drive-through Jungle Park which is right next to the Tabasco Factory. It reminded me of Jurassic Park, sans dinosaurs... but not gators. Yikes! 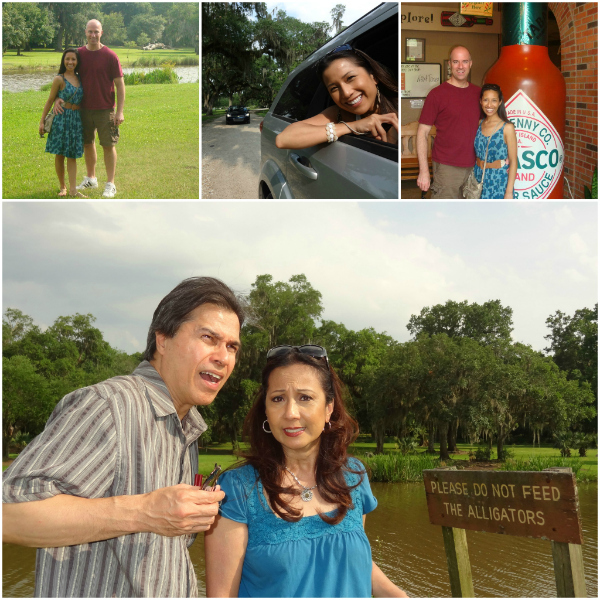 #11: The giant Tabasco bottle was an obvious photo op. My dad and sister love this stuff. Love. Ironically, Mr. TBS and I do not eat spicy foods. It takes two hot Cheetos to light my head on fire and send me into a coughing fit. #12: My parents are so serious all the time. Get a sense of humor, guys. ;-) Please notice the warning sign, and then look at picture #9 again. Do you see a fence behind us? I don't. Minutes later on the drive, we saw three alligators, so Little Lindsay Lou Who did not get out of the car after that. While I was gone, I posted a very personal letter to my younger self which spawned not only a wealth of support but a surprising amount of messages from others who relate to my experiences in one way or another. Those beautiful messages made me wonder if I have something to offer by sharing my story. Maybe so? Enjoy the day off from work (for those of you in the states), and play safely! Come back tomorrow for the second half of my vacation (+ some of Mr. TBS's delicious home cooking)! LOVE the pictures!! 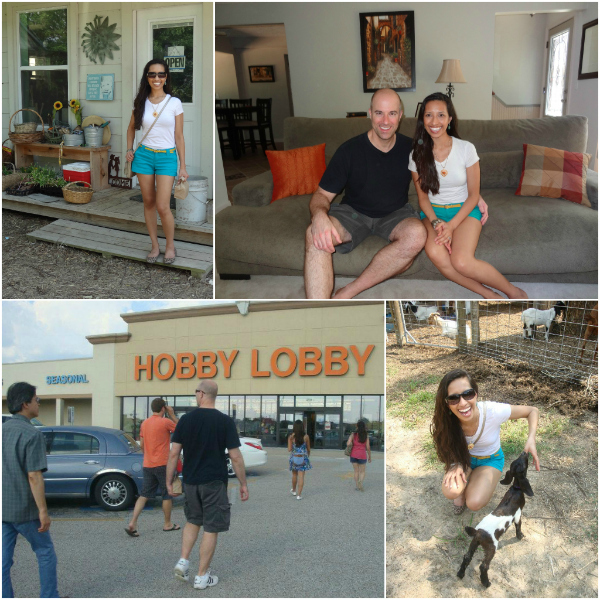 What a perfect weekend :) And seriously... Hobby Lobby is amazing! I am devastated (ha ha) that we have moved hours away from one. Love!! Looks like you had the best time! I would be terrified of alligators! Yiiiikes. And agree on the spicy foods..no thanks! Also, I'm obsessed with your teal shorts. Amazing. Also, SO GLAD YOU'RE BACK FRIEND!! !